Turkey’s policy on Syria differs from that of Iran, Russia and the United States, and it does not stand by any country, Deputy Prime Minister Bekir Bozdağ said. Turkey’s deputy prime minister, speaking to reporters in Qatar, said Turkey did not show any hesitation in working with any country that defended what he called the “correct principles” on Syria, pro-government Hürriyet Daily News quoted him as saying. Bozdağ’s comments came in response to a question about remarks by French President Emmanuel Macron, who said Turkey’s support of U.S.-led missile strikes against Syria showed it had “separated” from Russia, a staunch supporter of the Syrian government. 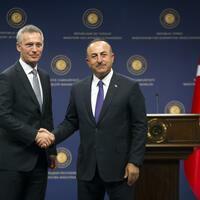 Turkish Foreign Minister Mevlüt Çavuşoğlu said on Saturday that Turkey had not taken sides. ‘’We are not making a choice between Russia and America. We are also not making a choice between the (Syrian) regime and America, France and Britain,” he said. Turkey is not standing by any country on Syria and its policy in the region is different from that of Iran, Russia and the United States, Deputy Prime Minister Bekir Bozdağ said on April 16.